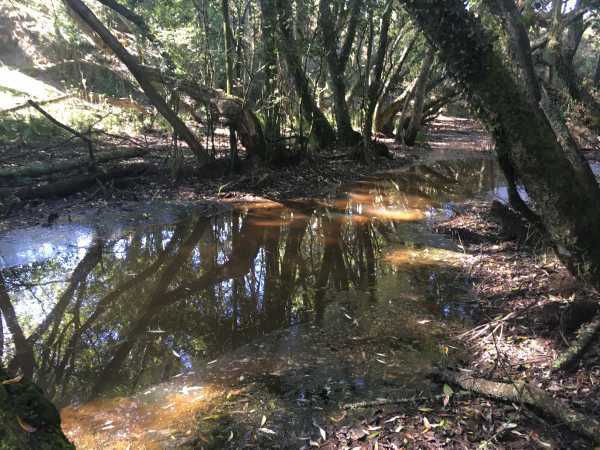 The Wharekorino Wetland was once covered in willow and privet, but Pūniu River Care Incorporated (PRC), an environmental kaitiaki organisation in the upper Waipā, took on the job of restoration. The Wharekorino Wetland is located south of Te Awamutu nestled right beside Mangatoatoa Marae. The area is identified as a “Potential Significant Natural Area” in the Waipā District Plan Appeals Version (2014). Hidden to the eye but known to many kaumātua of the area, the Wharekorino Wetland feeds the Pūniu River a respected and thriving awa. This made the wetland an ideal restoration project for the local community. With the help of Waikato River Authority funding, this two-year project led to 32,000 native species planted, 560 metres of fencing and 3.5 hectares of willow and weed control within and around the wetland. It provided marae based employment as well as giving the opportunity for the local hapū to be involved in the restoration of a significant natural wetland. Talitha Wanden, a spokesperson for PRC, says the wetland project helped to engage the community by holding two Wānanga/training days. These days consist of a workshop and also a planting day for Matariki. She also says that this was a good opportunity for their staff to use their ongoing training throughout the wetland and that a highlight of the project was being able to employ four teenagers over the summer holidays to help with the project. “The kaupapa behind this initiative is to introduce work experience to our young people while also providing education around improving the natural environment to help heal our people. We believe that by working to heal our land, we can help heal our people and reconnect them to the land to appreciate all that it has to offer” she says. The Wharekorino Wetland is subject to regular floods with a high volume of water passing through especially when adjacent rivers back flow. Once the newly planted native plants and plans are established this will help slow down water flow and enhance biodiversity and ecological services. The Wharekorino Wetland is now a great showcase for PRC and a template for all future wetland restoration projects. With a plant nursery located on site of Mangatoatoa Marae, the Wharekorino Wetland is even more special because once the newly planted native plants are established it will make it more convenient for native seed sourcing and Mātauranga Māori practices such as Rongoā, Mahinga Kai and Toi Māori for the local hapu. A future aspiration for PRC is to extend the current restoration works of the wetland, build a boardwalk, and continue using the wetland as a learning and training ground for all to enjoy.